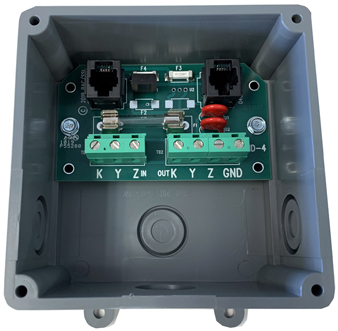 The CID-4 customer interface device is a low-cost, fused KYZ pulse termination and telecom device which supplements the electric meter’s KYZ pulse initiator and modem. It provides two sets of K, Y, & Z connector terminals, one for connection to the meter’s K, Y, and Z output terminals and the other for the utility customer’s energy control system input terminals. In addition, the CID-4 provides two RJ-11 or RJ12 phone jacks as a termination point for the meter’s modem and the incoming phone line, while supplying additional surge protection against transient voltage that may affect the inner wirings of the site. Connections to an electric meter’s modem to the telephone line are compact, simple and easy. The CID-4’s mounting configurations incorporates four knockouts for ½” electrical conduit which can be used in a wide range of connection schemes to the electric meter’s enclosure. The CID-4’s pulse input and output circuit’s terminal strips are “EURO” type. When the stripped wire has been correctly installed in the terminals “slot”, no conductive parts are exposed on the surface of the terminal strip, thus allowing the user maximum protection from accidental electrical shock. The K output of the CID-4 is fused providing current limiting designed to prevent damage to the meter or the customer’s energy control system. In addition, a built-in MOV transient voltage network is installed to suppress excessive transient voltages. Specialized Telecom surge suppression and fusing is included. The CID-4 features a watertight Noryl enclosure and offers excellent electrical insulation. A beaded-gasket lid ensures that the circuit inside remains dry and clean.